I recently attended a curator’s tour of the exhibition, King of the Comics, at the Billy Ireland Cartoon Library and Museum. The exhibit examines William Randolph Hearst's role in the birth of newspaper comics and traces the 100-year history of King Features Syndicate, the company he founded. King creations in the exhibition included: The Katzenjammer Kids, Happy Hooligan, Little Jimmy, Bringing Up Father, Krazy Kat, Polly and Her Pals, Tillie the Toiler, Popeye, Blondie, Barney Google and Snuffy Smith, Flash Gordon, The Phantom, Mandrake the Magician, The Little King, Henry, Prince Valiant, Buz Sawyer, Rip Kirby, Big Ben Bolt, Beetle Bailey, Dennis the Menace, Juliet Jones, Hi and Lois, Family Circus, The Lockhorns, Tiger, Quincy, Hagar the Horrible, Zippy, Marvin, Curtis, Bizarro, Baby Blues, Mutts, Rhymes with Orange, Zits, Tina’s Groove and Dustin. The artwork was amazing to see in its original size! "Santa Claus's Review!" 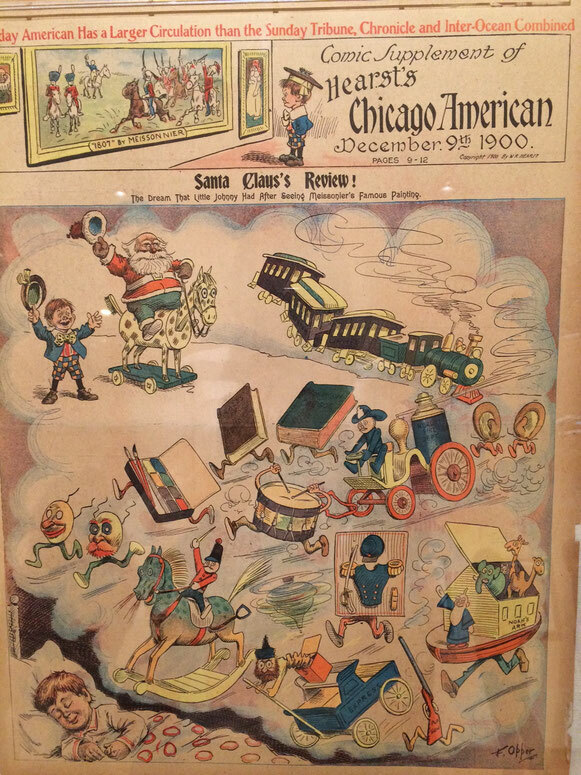 Comic Supplement of Hearst's Chicago American, December 9, 1900, Frederick Burr Opper, 1857-1937.